The February 2010 issue of the Technique Junkie Newsletter is now live! You can use your password to access the Subscriber only pages here: http://www.patstamps.com/SOP_home.html . If you need a password, email me -- I will be checking my emails all weekend and will be happy to send you yours. The newsletters were mailed yesterday, so check your mailboxes next week for this "pretty-in-pink" issue. I think you will LOVE this issue...I do! 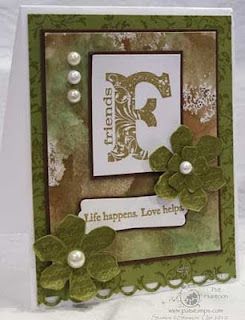 In the meantime, here is a little sneak peak for you using the new Double Embossed Metal Technique. Many thanks to Mary Garvey for submitting this technique! I just ADORE it and based on the feedback from people who saw the demo I did at the CHA Supershow for two solid days, I can tell you that YOU will love it, too! Have a great weekend -- can't wait to see what you create with the new techniques! PS: Did your subscription expire? You can still renew -- email me! It's about time for a giveaway, don't you think? Today's giveaway is a real Cutie Pie -- and just in time for Valentine's Day! The Artistic Outpost Cutie Pie stamp set featured above has 10 great images - two of which I used on the card on the right. I just love these nostalgic stamps! The card I made using the stamps uses the Brayered Impressions Technique (December 2009 issue of the Technique Junkie Newsletter) on the layer directly under our Cutie. I layered that on top of a piece of Cuttlebug Smoosh (October 2007 TJNL). I adore the way this card turned out -- It has some nice dimension in real life that my scan didn't catch. I have to case my own card so that I can give it to my own Cutie Pie! When you go to the Artistic Outpost site, note that Robyn offers free shipping for orders over $50.00. 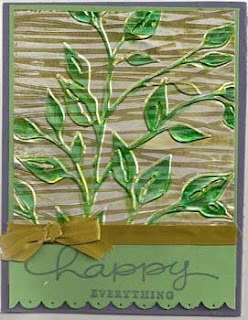 Check out the unmounted stamps page -- Robyn has posted some new offerings: Paris Exposition and Birds of a Feather. Use coupon code Spring2010 at checkout to receive 20% off each of these two new collections purchased together or individually. Both collections are available unmounted or pre-cut and mounted on EZMount cling foam. Note - code expires January 26th. Paris Exposition: Inspired by the Paris Exposition of 1889, for which the famed Eiffel Tower was built, this stamp collection features bold vintage style images including a French version of "What's up?". In French, we translated it to be "Quoi de nuef?" Birds of a Feather: Edwardian romanticism inspires this collection of bird images. Included is a perfect ATC background of German text. This collection is timeless and seasonless, though there is a special sentiment for your springtime projects. Simply leave a comment by Monday, January 25th at 9am EST. If you are so inclined, tell me which of the Artistic Outpost stamp sheets are your favorites (you can name more than one -- I personally could not pick just one!). The winner will be selected on Monday morning (1-25-10). Make sure that you leave enough information so that I can contact you to let you know you won. Just a reminder that Blogger does NOT leave me your email address. A great way to do this is to leave your email address in a spelled-out way, such as "p huntoon at optonline dot net." I will use my handy random number generator to pick the winning entry. You do NOT need to be a TJ subscriber to win. Good Luck! Remember to visit me at the CHA Supershow this Friday and Saturday! The winner of this giveaway is Vickie Kertz! Congratulations, Vickie! The CHA Supershow -- and a card for my Friends! Want to know a secret?!? I HAVE A TABLE AT THE CHA SUPERSHOW! I think I just shouted there. That's because I have been very quiet about my participation until now. Now I am going to shout it from the rooftops! I will be at the Consumer CHA Supershow on Friday and Saturday THIS WEEK. I will be demoing several techniques during the two full days that I am there. Techniques from both the current December 2009 Technique Junkie Newsletter issue, AND from the upcoming February 2010 issue. I will have special offers all weekend, and special guests will be stopping by to help demo and say hello! If you are going, stop by booth 1110 - inside the Craft Critique Pavilion. I can't wait to meet you! One of the things I will be demoing is the Antique Glimmers Technique from the December TJ Newsletter. The card on the left shows this technique....and I included a side shot of the card at the top of the post so that you can see just how beautiful this technique is in person (click on it so see it larger)! 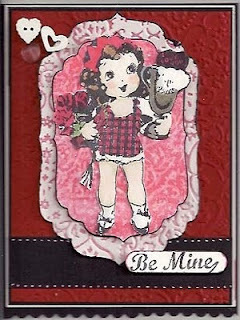 I used The Stampin' Up Set Vintage Vogue for my card.